Shimano PD-M995 25th anniversary edition pedal (click to enlarge). 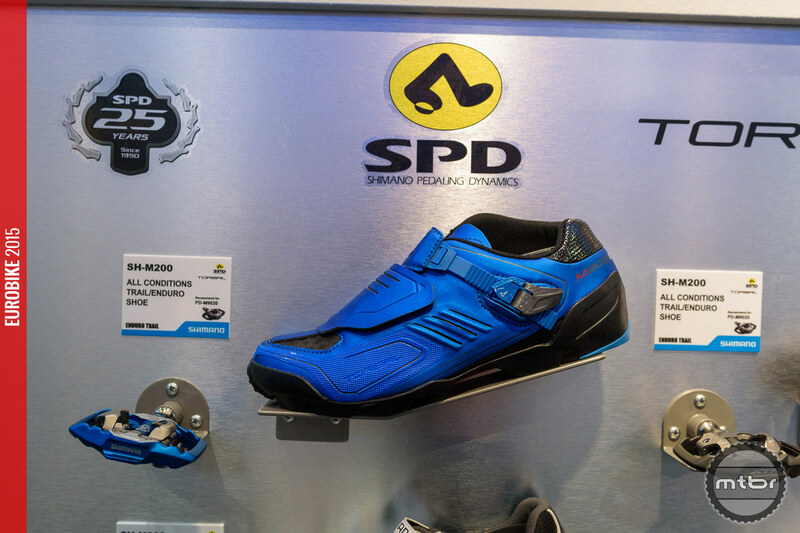 It’s SPD’s 25th birthday and Shimano is celebrating. The PD-M995 and PD-M990 pedals both got the limited edition electric blue color. 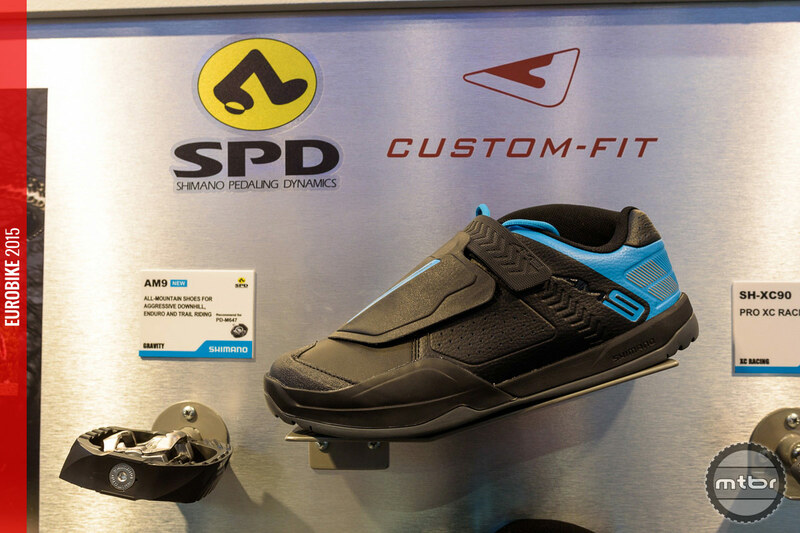 The SH-M200 enduro shoe also got the same color, so we expect some exciting color matching! Shimano AM9 Gravity shoe (click to enlarge). 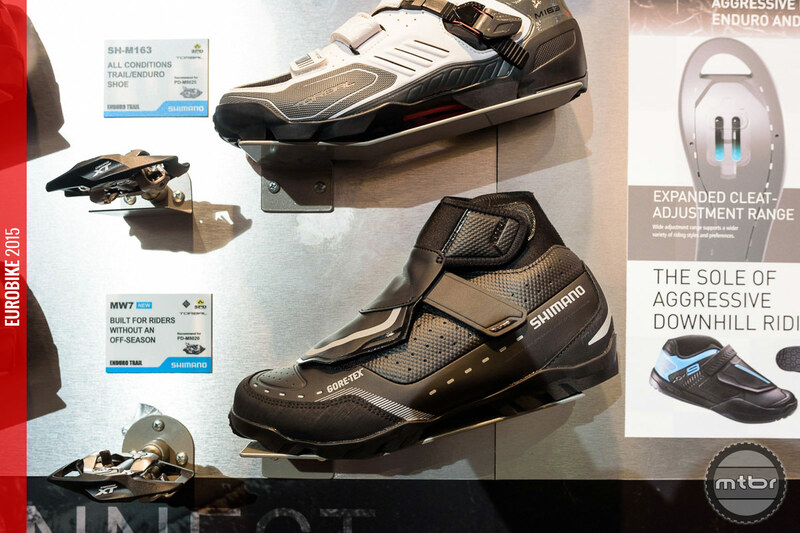 For all mountain, enduro or downhill use, Shimano has a new gravity shoe range. 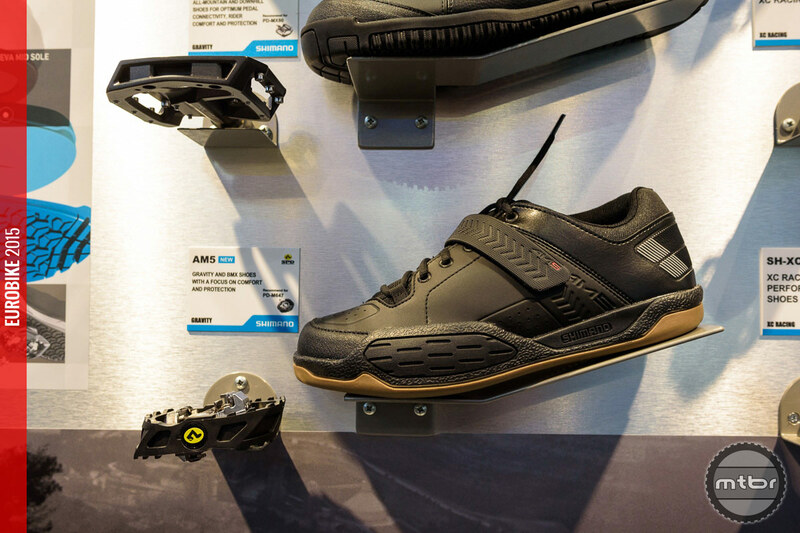 Three models are presented: on the high end you can find the black AM9 shoe, which is SPD compatible and suited for aggressive downhill, enduro and trail riding and has been designed in close collaboration with Gee Atherton. The black AM7 shoe is an all mountain and downhill flat-soled shoe with a Vibram outsole for optimum pedal connectivity, comfort and protection. Last but not least, the black or army green gravity and BMX AM5 shoe is SPD compatible and has a focus on comfort and protection. Shimano AM7 Gravity shoe (click to enlarge). 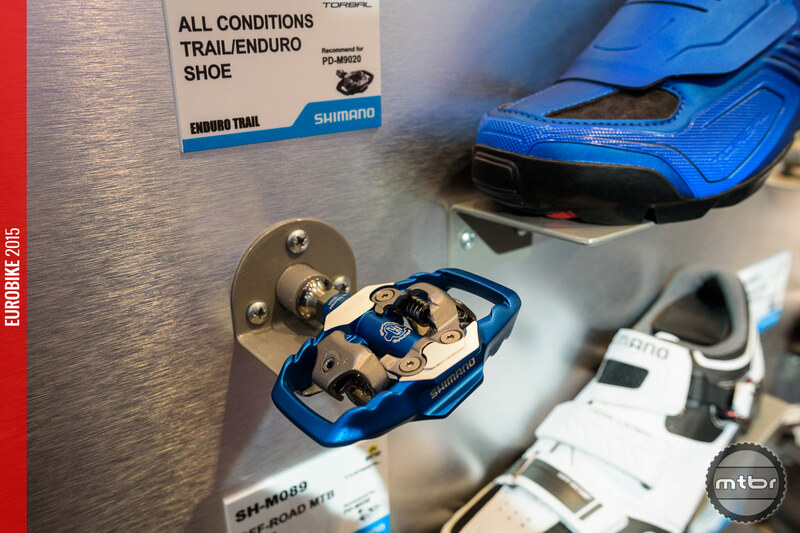 The shoes come with the new Shimano AM technology, which provides ample foot protection and improves downhill riding stability. A recessed pedal channel in the outsole increases contact stability between the pedal and your cleat while clipped out, and shaves the weight of the sole. 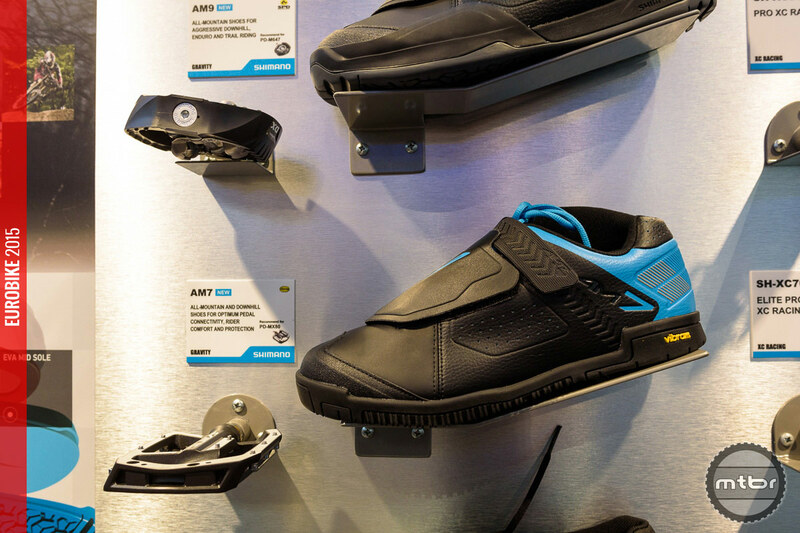 The shoes also have an optimized shank plate that delivers optimal rigidity and bike control. A high-traction tread pattern increases traction for superior off-the-bike grip and the shoes offer a reinforced sidewall that protects your feet on aggressive gravity rides. Special rubber compound maximizes grip and durability, while the EVA foam mid-sole construction reduces weight and boosts walking comfort. 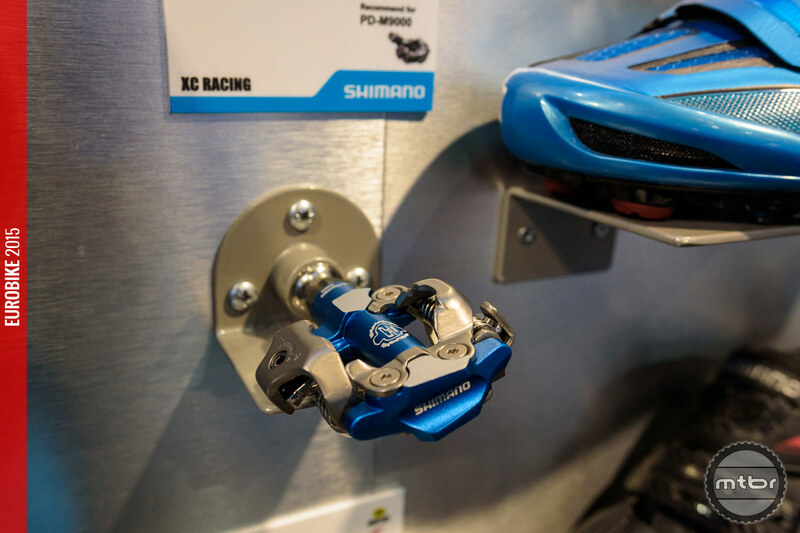 The cleats have wide adjustment range to support a wider variety of riding styles and preferences. Weights for a size 40 are: 744g for the AM9 shoes; 731g for the AM7 shoes and 941g for the AM5 shoes. Shimano XM9 Mountain Touring shoe (click to enlarge). If your rides consist of significant hike-a-bike sections, you might consider one of the two new models, the XM9 and XM7 shoes, that are tailored to the more rugged terrain encountered in adventure cycling. With its high-ankle protection and walking support, the XM9 takes on the appearance of a hiking boot rather than a traditional cycling shoe. It has a mini power retaining strap, ideal combination of lightweight, waterproof Gore-Tex fabrics and high-grip Vibram outsole. If you want to retain the look of a trekking trainer the XM7 is the answer. Designed for riders who are likely to spend as much time off the bike as on it, the XM7 delivers a shoe that is happy to spend all day providing your feet with the optimum cycling and walking combination. The upper part of the XM7 shoes consist of natural Nubuck leather and has a reinforced toe box, while a Gore-Tex liner allows your feet to breathe. The Vibram outsole has a flexible half-length shank plate and shock absorbing EVA. Both the XM9 and XM7 come with a screw-in plastic cap for the recessed SPD cleat which unscrews to add cleats if you would like to. Weights for a size 40 are: 1070g for the XM9 shoes and 870g for the XM7 shoes. Shimano MW7 Mountain Touring shoe (click to enlarge). For riders that don’t recognize an “off-season”, the MW7 boots could be a good choice. With a waterproof Gore-Tex insulated comfort liner and heat-retaining fleece lined insole you are protected against the weather. The MW7 features Shimano’s Torbal torsional midsole giving you a stiff instep section and an independently flexible front and back section. High-traction rubber studs on the outer edges of the sole ensure excellent traction. The MW7´s molded toe cap and ankle support, cupped high sole and instep, and tough, padded synthetic leather surround protects the foot. Lacing is handled by a speed-lacing pull-cord and a Velcro armored lace shield. Weights for a size 40 are 832g. For more details visit bike.shimano.com. Shimano PD-M995 25th anniversary edition pedal. Shimano PD-M990 25th anniversary edition pedal. Shimano SH-M200 25th anniversary edition shoe. 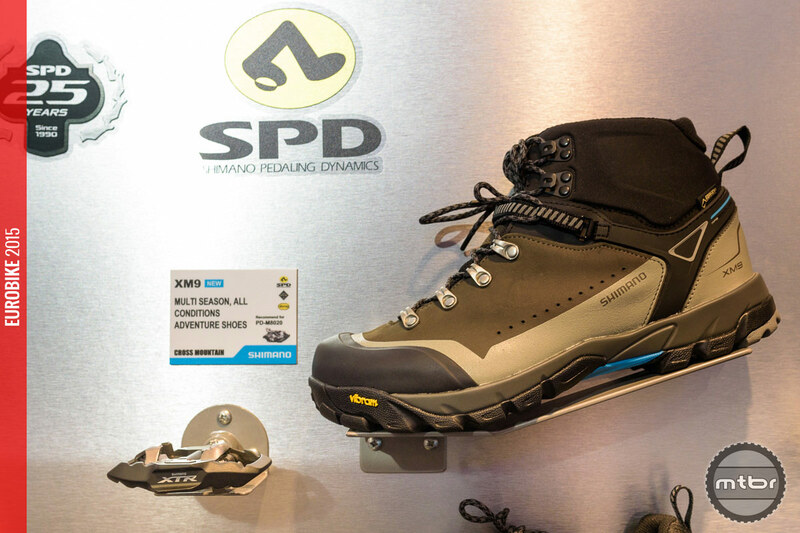 Shimano XM9 Mountain Touring shoe. 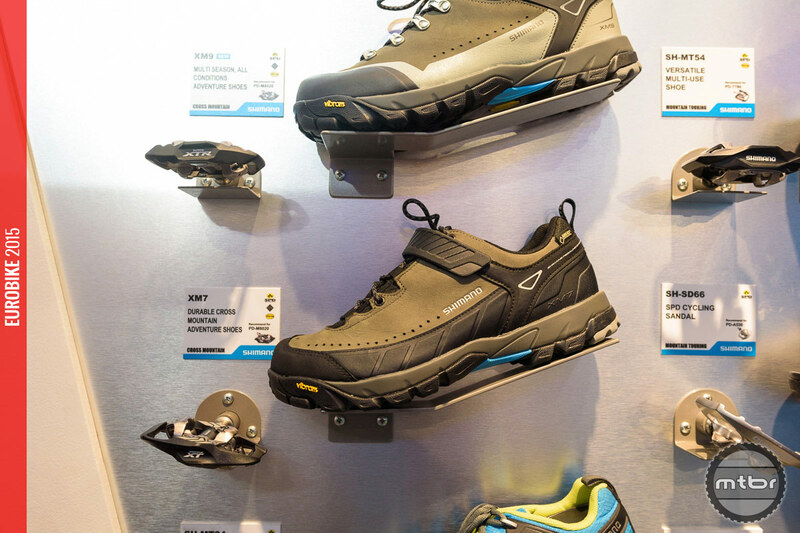 Shimano MW7 Mountain Touring shoe.